Ole Gunnar Solskjaer has confirmed his contract with Norwegian side Molde has been "terminated" as he closes in on securing a permanent job with Manchester United. 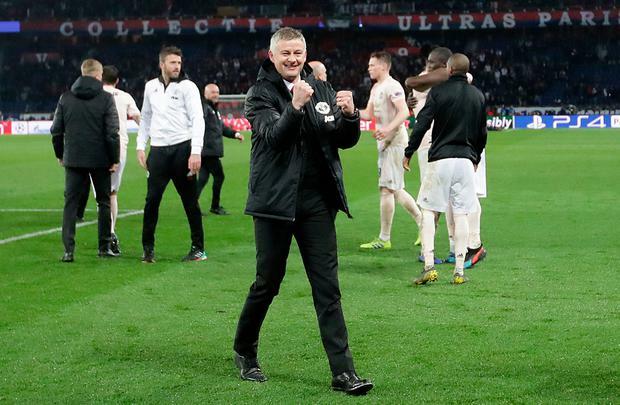 Solskjaer, who worked his magic yet again in beating Paris St Germain on Wednesday night as United marched into the Champions League quarter-finals, will be rubber-stamped for the job at the end of the season. Solskjaer remained tight-lipped about his United future after Wednesday's jaw-dropping triumph in Paris only heightened talk of when rather than if he got the managerial post on a permanent basis. The caretaker boss fuelled it himself by admitting to a Norwegian podcast that his contract with Molde, the club he was supposed to return to in the summer, had been terminated. "That's just the media," he said of the speculation. "I am not here to get excited, I am here to do my job. "And of course that contract issue there, you cannot have two contracts when you're a manager, so that contract was terminated. Solskjaer has been looking ahead to summer signings and pre-season plans, but his main focus now is Sunday's trip to Arsenal. "Anthony will be available and hopefully we'll have Nemanja and/or Ander ready as well. "We're looking better for it. They just need to have another couple of days training with the team. They've done well with their recovery work." "He scores more from inside the box, and that's what Rashy has to do - improve his tap-ins, movement in the box, staying in the box, getting away from the centre-backs a few more times.